Judas, the unfaithful disciple, steps forward and cries, "Hail, Master!" and kisses Jesus on the cheek. HROUGH THE DEEP shadows which fell from the buildings along the streets a silent figure glided along, hurrying toward the assembly-room where the enemies of Jesus were sitting together waiting. 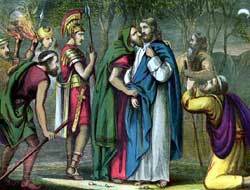 That silent figure was the evil-minded disciple, Judas Iscariot, who was hurrying on his way to sell his Lord. Soon the footsteps of Judas fell on the floor of the hall, and his knock sounded on the door of the assembly-room. In the reply to the call, "Who is there?" came the answer, "He for whom you wait," and quickly the door was thrown open and Judas entered. Now there followed a hasty conversation, some argument, and finally thirty pieces of silver were counted out and handed to Judas. Then the assembly broke up, each man hurrying to get a torch or to summon the soldiers who should on their midnight errand. While this was taking place, Jesus and the eleven disciples had left the room up-stairs where they had eaten the last Passover supper together, and had gone outside the city to a garden across the brook Kidron. Here at the entrance of the garden Jesus had told eight of the disciples to wait, and, taking with him Peter, James, and John, he had gone into the deeper shadows of the trees to pray. But while Jesus prayed the disciples fell asleep. They could not understand why he should seem so troubled and they did not know how to comfort him, and just when he longed to have them near to pray with him they slept. Three times Jesus went to waken Peter, James, and John, but not once did they offer him the comfort he sought. Then while he prayed in agony alone God sent an angel from heaven to strengthen and comfort him. For Jesus knew the sorrow that was soon to come; he knew what Judas was even then doing; and he knew his enemies would not cease to torture him till he should be hanging dead upon the cross. Not only that, for Jesus knew also that he must bear the sins of the whole world in order to become the Savior of men. And because he had a body such as we have, he dreaded to suffer the pain of such a death, and he dreaded to be left alone by those whom he loved. So he asked God to take away the suffering from him if such a thing should be possible. But he added, "Let thy will, not mine, be done." When Jesus had roused the sleepy disciples the third time, he told them to arise; for it was time for them to be going on their way. And they rose up to follow him out of the garden. But as they went toward the entrance they saw a band of men coming to them carrying torches as if they were searching for some one. Jesus walked up to the men and asked, "For whom are you seeking?" They replied, "For Jesus of Nazareth." "I am he," answered Jesus. And the men fell backward. When they rose, Jesus asked them the second time whom they were seeking, and again they said, "For Jesus of Nazareth." Judas, the unfaithful disciple, was with the band of men, and he stepped forward and cried, "Hail, Master!" and kissed Jesus on the cheek. But Jesus knew the evil thought that was in Judas mind, and he looked sadly into the guilty face of his unfaithful disciple and asked, "Judas, do you betray the Son of man with a kiss?" Judas had told the band of men the sign by which they might know whom to take for their prisoner, and that sign was the kiss he had given to Jesus. Now the soldiers took hold of Jesus roughly and prepared to lead him away. At this Peter was thoroughly aroused from his sleep. Drawing a short sword, which he carried in his belt, he struck at one of the soldiers and cut off his ear. But Jesus seemed displeased, and told Peter to put away his sword. Then he healed the soldier's ear; and Peter, unable to understand how he might now defend his master, sank back into the shadows with the other frightened disciples. The soldiers then bound their prisoner, and the procession started toward the assembly-room where the enemies of Jesus were waiting impatiently. And far behind Peter followed, wondering what he should do, and yet fearing that the soldiers might take him, also. First the soldiers brought Jesus to the house of a man named Annas, who was father-in-law of the high priest, Caiaphas, and there his trial began. John, one of the disciples, gained admittance at the door, for he was acquainted with the household of the high priest. And he went in where Jesus was. But Peter stood outside, for he was a stranger, and the doorkeeper, a young girl, would not let him in. Presently John spoke to the doorkeeper, and she allowed him to take Peter into the court-room, for the night was cold. When Peter was inside the young girl said, "Are you not also one of his disciples?" But Peter was afraid, and he said, "No, I did not know the man." In the open court a fire was burning, and Peter went near to warm himself. Around the fire stood other men, some who were servants in the high priest's house and others who were officers. One of the men by the fire then turned to Peter and asked, "Are you not one of this man's disciples?" Again fear crept into Peter's heart, and he replied stoutly, "No, I am not!" But a soldier standing by who had been in the garden when Jesus was taken had seen Peter use his sword, and he spoke, saying, "I saw you in the garden with him!" Peter denied fiercely, and pretended that he had never known Jesus at all. While this had been happening to Peter, out in the high priest's courtyard, the high priest and others had been asking Jesus questions about his teaching and had been treating him shamefully. Then the enemies of Jesus led their prisoner out of the high priest's house, and as he passed by he looked sadly upon Peter. And Peter remembered how Jesus had told him that before the return of another day he would deny three times that he had ever known the Lord. Now tears filled Peter's eyes, and he turned blindly away from the fire and rushed out of the door, to weep bitterly. He saw himself no longer a true man, brave, and ready to help in the work of his master, but a coward, ashamed to own that he had once proudly followed the innocent man who now stood bound in chains and condemned to die.